Micronic released the new innovative 2.00 ml Tubes with External thread. 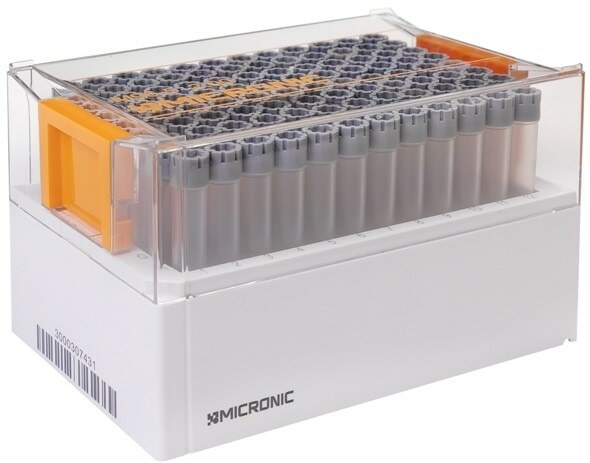 These 2.00 ml tubes are the first tubes of its kind, enabling researchers to store high volume samples in a space-efficient 96-well format. The tube provides an extraordinary storage capacity in 96-well format racks with a massive working volume of 1.55 ml at room temperature. The high volume tubes are designed with thick tube walls for long-term sample storage and can be used to store samples down to -80 °C. Until now, the massive working volume of the new 2.00 ml tubes with external thread was unseen in a 96-well format. The novel tube shape allows researchers to start using high volume samples in automated systems. The tubes are standardly provided with 2D Data-Matrix codes. The codes are permanently laser-etched onto an inseparable black code surface on the bottom of each tube. Because the codes can never wear or fall off the tubes, absolute sample traceability is guaranteed. The 2D codes also have a human-readable code for additional verification. Using externally threaded tubes for sample storage eliminates the possibility of the sample coming into contact with the screw thread, greatly reducing the chance of cross-contamination while improving sample integrity. The triple thread of the tubes gives excellent closure and horizontal placement of the cap to ensure long-term sample preservation and storage.